lower right in pen and brown ink: Taraval inv. ; lower left in pen and brown ink: T.
Seiferheld and Co., New York; William B. O'Neal [1907-1994], Charlottesville, VA, October 1971; gift to NGA, 1991. Dürer to Diebenkorn: Recent Acquisitions of Art of Paper, National Gallery of Art, Washington, D.C., 1992, no. 39. Drawings from the O'Neal Collection, National Gallery of Art, Washington, D.C., 1993, no. 19. Drawings from the O'Neal Collection, Georgia Museum of Art, The University of Georgia, Athens, 4 May-16 June, 1996. 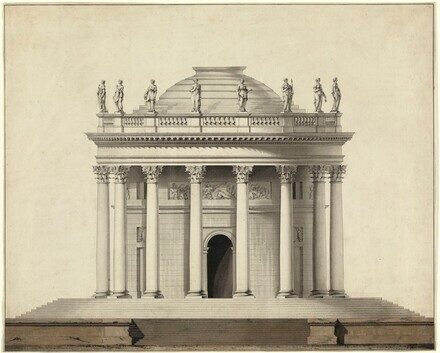 "Drawings for Theater and Architecture: A Special View of a Noted Virginia Collection of Master Drawings," Arts in Virginia, 15 (Spring 1975), 2, 13 (illus.). Grasselli, Margaret Morgan. Renaissance to Revolution: French Drawings from the National Gallery of Art, 1500-1800. Exh. cat. National Gallery of Art, Washington, 2009: 244, fig. 1.